Road trips are always epic for me. I live in the Texas Panhandle where chronic dryness and drought are the rule. Aside from an intermittently running river and a handful of farm ponds, water isn’t in abundance near where I live. Therefore, to get to unique and out of the way fly fishing waters, I have to travel often. Early one October morning I packed my camera gear and fishing equipment for the long drive to unfamiliar waters. From my house to Caddo Lake is 409 miles of long and lonely roads that take me across the top of much of Texas along the Red River corridor. Somewhere near Bonham, I made a bend to the southeast and traveled the last quarter of my trip. Along the way, the landscape transforms from open rangelands to hardwoods and pine trees, and the culture morphs from a western attitude to one that’s steeped in traditions of the old south. In the past, I’ve traveled all over Texas and have been to nearly every corner save, for some reason, this one. Caddo Lake is a mystery to me, and I’ll find that it is indeed a mystery to others who have experienced it in its 200 or so years of known existence. From the banks, Caddo Lake doesn’t look all that big since there is not a huge body of water that lies before you. Instead it exists as a giant swamp with backwater sloughs that wind in and out of the giant cypress trees that stand draped in Spanish moss. 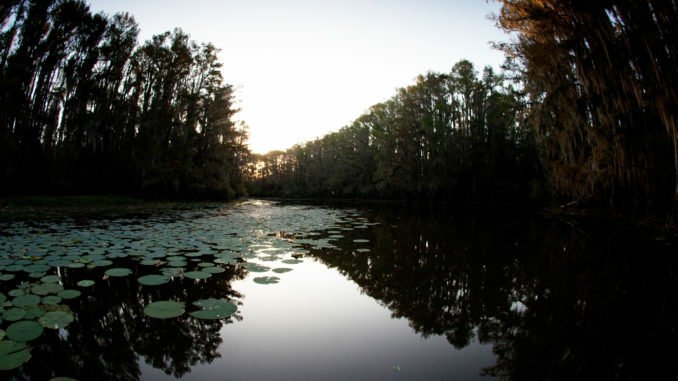 In all, 25,400 acres of big, mysterious swamplands straddle the Texas/Louisiana border and takes its name from the indigenous Caddo Indian tribes who once inhabited the area. Overall the lake is shallow and is only 20 feet at the deepest. Much of it, though, is shallow enough for trees to crowd the water. So numerous are the cypress trees that they make up the world’s largest cypress forest. There are some areas of significant open water, but many of those places have a carpet of lily pads and other aquatic vegetation that stretch for hundreds of yards. In fact, 60 percent of the lake is covered in aquatic vegetation. This place is so unique it is recognized as an internationally protected wetland. The lake is also the second largest natural lake in the south and the largest (and one of the few) natural lake in Texas.